This Saturday was International Women’s Day! To keep the celebration going, here are a few of the outstanding WordPress.com blogs by, for, and about women. We also enjoy their tagline, “Because the personal is historical” — a spin on the classic feminist line “the personal is political” that speaks to the blog’s historical bent. Feminism: it’s not only for women! Decidedly male blogger David Futrelle uses Man Boobz to skewer anti-woman writing across the internet. Anna keeps thing timely — you’ll find posts on Miley Cyrus’ “Wrecking Ball” video (and why it’s not raunchy) and sexism in How I Met Your Mother memes mixed with broader discussions of third-wave feminism and marriage equality. Her blog is a potent mix of pop culture and philosophy that makes gender issues relevant. blue milk: feminist perspectives on motherhood. The Gender Report: representations of gender in online news media. Make Me a Sammich: feminism with a US focus. Fiending for Hope: a blog focused on sexual violence, from the founder of Hollaback! Boston. Papier Haché: the site of transgender writer and advocate Kate Haché. Wonderful! Thank you for sharing it. There are campaigns for international women’s day to become a holiday in the uk, I hope it does! 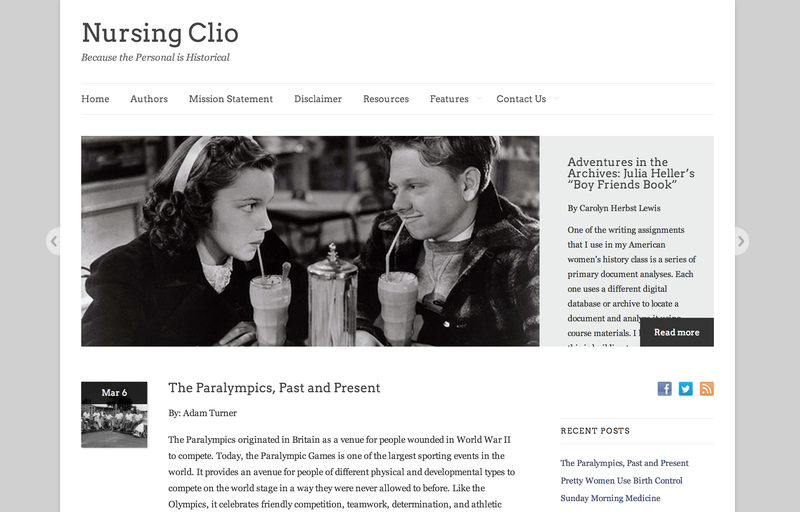 In honor of International Women’s Day, WordPress named its favorite feminist blogs, including Nursing Clio! Thanks for letting others know about such wonderful blogs!! I think every country should have this as a holiday!! Justice, fair play, equality in the eyes of the (insert misnomer of own choice here) — how come we get words not deeds? Hence your post … which shouldn’t be damned well necessary. Sadly, it is. This is great! I’m excited to read these cool blogs. Awesome to discover fellow feminist writers. Also check out http://feministssa.com – a blog for Feminist South African writers. Congrats to two of my best former students, who now produce the Gender Report. And thanks, Michelle, for a great list. Thank you for letting everyone see that and enjoy the day that celebrates women. Thank you for your post. I loved it. It’s lovely seeing people that are realizing their rights to happiness and fulfillment. Love the blog. Thank you.